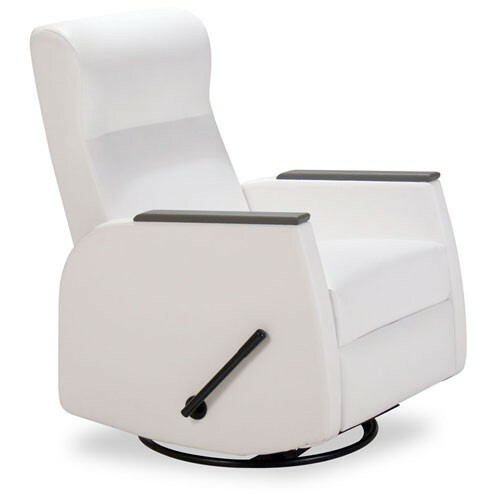 Glider Recliner is a simple to use recliner that glides back and forth. Gliding is similar to rocking, but instead of moving in an arc the user just moves back and forth horizontally. This glide tends to be a bit smoother and some prefer it to rocking, especially when dealing with newborns. Also, the back is contoured for increased lumbar support and comfort. The contoured design also creates a nice headrest for you to comfortably lean back on to relax. The back is seamless, too. This provides a modern clean look. It also makes it easier to clean since crumbs will not be able to hide in back seams. Another great feature is the wide shoulders. This is especially helpful if you need to position a patient in the chair and adds to their comfort. In addition, this chair is easy to use. The side lever operates the footrest and the back is operated by pushing on the arm. When reclined, the chair automatically stops gliding and locks in place to prevent any more gliding. This reclining chair comes with a stationary base, but a transport base is available. Contact us for pricing and availability for a transport base and other accessory and additional color options.